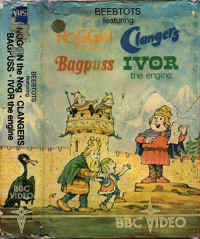 Although Noggin's heyday was before the advent of the home VCR, several of his adventures have made it on to video tape at one time or another. 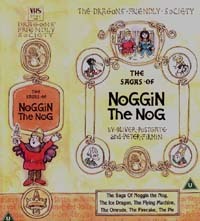 After an absence of several years in the 1990's, Noggin returned on video in style on 30th September 2000 with the release of "The Sagas of Noggin the Nog", as shown below along with details of the other, now sadly deleted, video releases. Details of individual tales on video appear along with that tale in "The Tales" section. 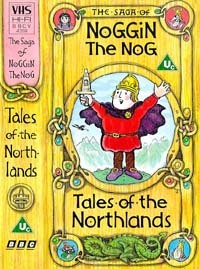 As well as being the first release of all of the Noggin videos in one double video set, the release of The Sagas of Noggin the Nog saw the first showing of the first Saga in 30 years. 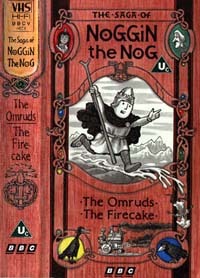 In all, the video contains "The Saga of Noggin the Nog" (aka "King of the Nogs"), "The Ice Dragon", "The Flying Machine", "The Omruds", "The Firecake" and "The Pie", storylines and details of which can be found in "The Tales" or by clicking on each individual title. Released by the BBC in 1990, this video contained 2 stories: "The Ice Dragon" (in colour) and "The Flying Machine" (in black & white). More details of these individual stories can be found in "The Tales" or by clicking the titles. This second recent video, released by the BBC in 1991 contained the tales of "The Omruds" and "The Firecake". Again, fuller details of these stories can be found in "The Tales" section. This video compilation contained a number of stories from the Smallfilms stables, such as The Clangers, Bagpuss, Ivor the Engine and the Noggin the Nog tale "The Pie". As far as I am aware, this was Noggin's only appearance on video in the USA.